Here at the Hendricks County Insider, we work to keep you up to date on all the happenings around our great county. There are so many events and activities, it&apos;s easy to fill these summer weekends right here at home. On the first Friday of every month May through October, the historic Hendricks County Courthouse Square in downtown Danville provides the perfect backdrop for a summer tradition: First Friday Cruise-In. Even if you are a novice, like me, you&apos;ll enjoy this free, outdoor event that will have you reminiscing about the simpler times. 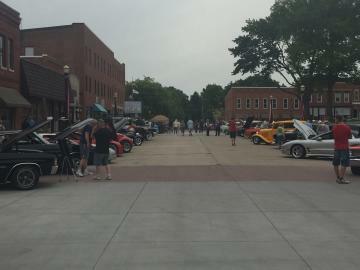 From 5-9 p.m., you&apos;ll find pristine cars of various makes, models and years lining the courthouse square. Most of them have the engines propped up and windows down so that you can see what&apos;s inside and out. Proud owners also are around and are usually more than happy to tell you about their trophies and the work that went in to restore them. I might not know too much about the gorgeous cars I see when wandering one of the Cruise-Ins, but I really admire the attention to detail and time the owners have invested. An opportunity to entertain the family and enjoy the summer evening air is also much appreciated. As a member of the Danville community, I know that lots of folks have made a tradition of meeting up with friends to walk the Cruise-In and then enjoy dinner and drinks at one of the restaurants on or around the square like Frank&apos;s Place, Mayberry Cafe, Diesel&apos;s Sports Grille or various other choices. This monthly, summer event cruised into town eight years ago with the Indy High Flyers Car Club. This free event continues to bring in a variety of classics, vintage, sports models and muscles cars. The owners, in my experience, are super friendly and love the opportunity to talk shop. Not that I could hold that type of conversation. A disc jockey offers fitting tunes to this casual event that only further encourages even the novice like myself to simply wander the cruise-in and enjoy this summer event. Bring the kids or join your friends and take advantage of this awesome opportunity right here in Hendricks County. 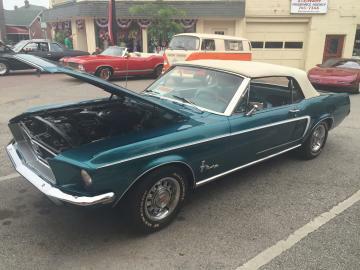 The next Cruise-In is scheduled for July 1. See you there!